Centrally located downtown, this hotel boasts a luxury day spa, 4 restaurants and outdoor rooftop pool. SAP Center at San Jose and San Jose State University are 10 minutes' walk away. Plush bathrobes and exquisite Le Labo bathroom toiletries are provided in all rooms. Each spacious room at The Fairmont San Jose also offers a marble bathroom with walk-in shower, separate bathtub and bathrobes. A minibar, cable TV and a coffee maker are also provided. Tova Day Spa, San Jose Fairmont’s spa, features a steam room, sauna and hot tub. A variety of massages, face, body and nail treatments are offered. Guests can also use the gym. Dining options include a casual breakfast or lunch at the newly renovated Fountain Restaurant, a steak lunch or dinner at The Grill on the Alley, sushi from Takai or drinks and appetizers right in our lobby lounge. 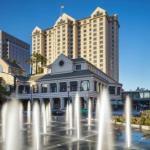 San Jose Convention Center is 5 minutes' walk from The Fairmont. The Children's Discovery Museum is 15 minutes' walk away. Heritage Rose Gardens is 10 minutes' drive away..
We plan to add more related stuff like: pet friendly hotels in San-Jose, California dog friendly hotels in San-Jose, dog parks in San-Jose, pet stores in San-Jose, CA, and pet spas in San-Jose. Keep checking for more!